The End of the Bronze Age – When is Guessing Okay? Recommended. You should check it out. Robert Drews’s book, The End of the Bronze Age, is an interesting read in terms of content and methodology. Drews attempts to explain the sudden end of the Bronze Age in the Eastern Mediterranean by attributing it to a mysterious Catastrophe, which has its origins in military change. According to Drews, the losses of palace-based aristocratic chariot soldiers both on the battlefield and in societies created a disruption within many Late Bronze civilizations from which there was no recovery . 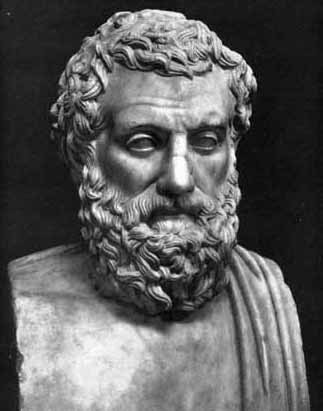 Drews makes the case that this military change was the direct cause of the Catastrophe, which ended or weakened dominant civilizations across the Eastern Mediterranean around the year 1200 BC, and marked the transition from the Bronze Age to the Iron Age. When determining his hypothesis for the Catastrophe, Drews considers a number of factors. First, what was the Catastrophe and, specifically, what was the difference between the civilizations of the Late Bronze Age and the Early Iron Age? Drews spends the first two parts of his three-part book explaining both the nature of the Catastrophe and debunking the alternate explanations for it: earthquakes, migrations, drought, systems collapse and raiders. Critics of Drews’s work have varying opinions on this analysis of the alternate causes of the Catastrophe. Young and Thomas make generally favorable remarks, but there is tough criticism from Van Wees and Cline. The former characterizes Drew’s attempts to discredit the alternate explanations, particularly the “raiders” theory as unconvincing due to a lack of evidence . Cline accuses Drews of distorting conflicting explanations for the Catastrophe to fit his hypothesis  and of incorrectly labeling systems collapse and raiders as consequences of the Catastrophe, instead of causes. In part three of the book, Drews details the prominence of chariot warfare in the Late Bronze Age and its disappearance in the Iron Age. The decline of the chariot coincided with the rise of infantry as the main focus of the Iron Age military. This distinction is the focal point of Drews’s work. Let’s be real. We all know it was the Sea People, right? 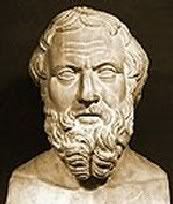 The great obstacle to any study of the ancient world is a scarcity of sources. Even within the range of available sources, there are bad translations, bias, and great variances in quality of authorship. Does this great obstacle and its associated, smaller obstacles excuse Drews’s approach, in which he unabashedly admits guessing at the main points in his work? Young seems to applaud the effort. I am conflicted. On the one hand, all hypotheses are guesses to some degree, backed by evidence. On the other, when evidence is so lacking, is it better to not present a half-baked hypothesis? There are more questions to ask when confronting this particular historical issue: is there a single cause for the Catastrophe or multiple causes? Is the cause the same from civilization to civilization? How sudden was the transition from chariot to infantry? Drews presents the idea of a military shift as singular causation, but there are critics that remain unconvinced. Cline states that Drews’s explanation for the Catastrophe is not the only possible explanation, and does not provide the final answer . Young states that Drews’s argument does not negate the theory of systems collapse effectively, and that a military change and systems collapse are not mutually exclusive . Haggis is concerned with Drews’s one-size-fits-all approach to causation. 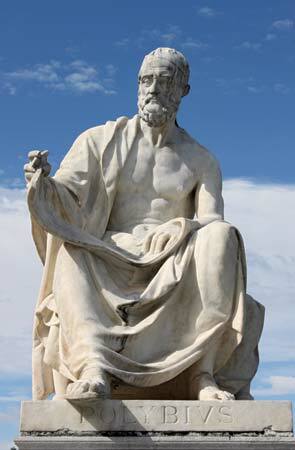 Drews presents the military shift as the singular cause of the Catastrophe for civilizations from one end of the eastern Mediterranean to the other. Were these cultures not different from one another? Haggis suggests this hurts Drews’ assertion of singular causation, and that Drews should provide more explanation regarding to the culturally specific variables of each region, relative to his thesis . Lastly, the lack of sources and frames of reference on time have the potential to make events in the ancient world seem closer together and more connected in the causal chain. This is another criticism that Haggis has of Drews’s argument. Haggis suggests Drews’s narrative makes the Catastrophe seem like it occurred more quickly than it actually did. Haggis says that length of time could have allowed for a more gradual, internal shift to dominant infantry than Drews suggests . Young defends Drews by stating that the destructions of the Catastrophe took place in a compressed enough period of time for them to be considered closely related events. After thinking about it for a bit, I can see that Drews is sincere about what he is attempting to do. At one point, he even unnecessarily apologizes for writing a military history while not being a military historian . So he is aware that he is operating in an imperfect situation and he makes it clear that he’s doing the best he can with the resources he has. I also suspect that his reviewers were happy to see a new work of scholarship on the Late Bronze Age Catastrophe and were respectful of an attempt to inject new life into an old mystery. Ancient history can be very intimidating to write. Ideas are often stopped before they start because of the vast amount of writing that has already been done on the era, combined with the scarcity of sources. It just struck me odd when I was reading Drews’s conclusion that I came across so many terms indicating uncertainty. This is the thesis wrap, where the author is supposed to be most convincing in his argument. On page 216 and 217, I flagged a “whatever,” a “very likely”, two “imagines” and a “perhaps” all in a pretty close arrangement regarding a key point of support for his thesis . I agree with Young, who says that Drews’s work seems partially developed and he would like to read more of what Drews has to say . It’s a very entertaining book, but I think Drews is really stretching his reasoning pretty thin. I want to believe him, but I’m sticking with multiple causation when it comes to the Catastrophe. Stephen Morillo, Jeremy Black, and Paul Lococo, War in World History: Society, Technology, and War from Ancient Times to the Present, vol. 1 (New York, NY: McGraw Hill, 2009), 14. Eric H. Cline, “Review,” Journal of Near Eastern Studies 56, no. 2 (April 1997): 127. 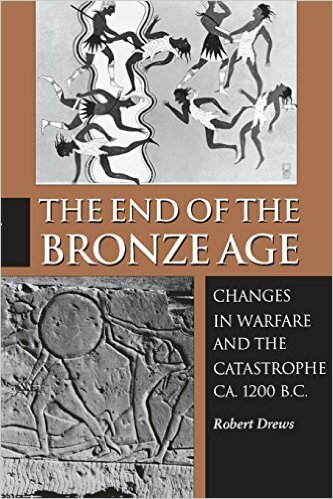 Robert Drews, The End of the Bronze Age: Changes in Warfare and the Catastrophe CA.1200 BC (Princeton: Princeton University Press, 1993), 98. Donald C. Haggis, The American Journal of Philology, Vol. 116, No. 2 (Summer 1995), 323. T. Cuyler Young, Jr., “Review,” Journal of the American Oriental Society 115, no. 2 (June 1995): 312.